Two-time Grammy-nominated blues-rock guitar icon Joe Bonamassa announces his tour dates in support of his upcoming all-original Studio Album Redemption (J&R Adventures), which was released September 21, 2018. Hailed worldwide as one of the greatest guitar players of his generation, Joe Bonamassa has almost single-handedly redefined the blues-rock genre and brought it into the mainstream. Backed by a stellar band of legendary musicians including Anton Fig (drums), Michael Rhodes (bass), Reese Wynans (piano/organ), and featuring soulful background singers and fantastic horns, the show features brand new songs alongside career-spanning favorites. Watch the music video for Bonamassa’s latest single “Redemption” here. 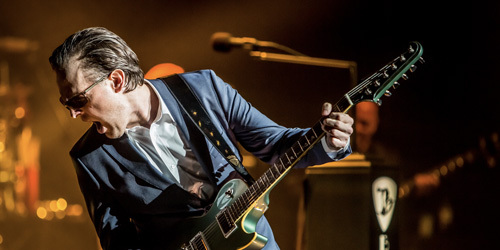 By exceeding his own vertiginously high artistic goals, Bonamassa has shattered all expectations with this record and has reached new audiences — no mean feat when you continue his astonishing track record of releases, which now includes 20 #1 Billboard Blues Albums (more than any other artist in history). Bonamassa’s career in the music industry has built steadily over the years and is only gaining more momentum. Download a free song from Joe Bonamassa at jbonamassa.com/freemp3.